Immediately illuminate blonde and silver hair with this restorative ‘silkening’ treatment, a lightweight concentrate that repairs and prevents damage while banishing brassiness and increasing elasticity to soften dry, brittle strands. Perfect for damaged, porous blonde hair, the formula features strengthening proteins, elasticising extracts and brightening violet pigments. The ultimate in luxe, cult hair care, Oribe has gained a permanent place in the hearts of the beauty world’s ‘best tressed’ – try this and you’ll soon see why. 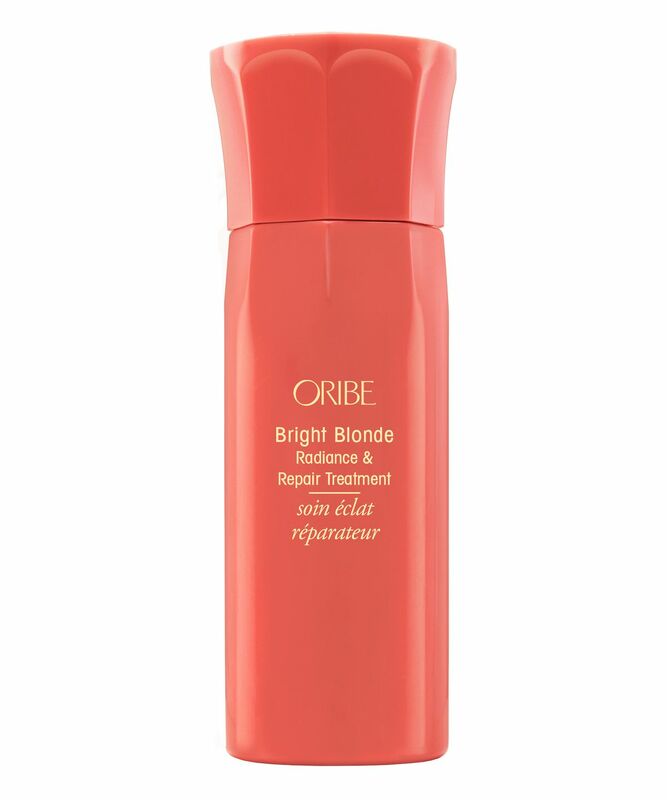 Let your strands stay bright and strong with Oribe’s Bright Blonde Radiance and Repair Treatment, a restorative spray used in place of conditioner to repair and prevent damage, while keeping brassiness at bay and leaving hair ultra-soft. A luscious lightweight concentrate, this is perfect for damaged, porous blonde hair, immediately increasing elasticity, sealing split ends, treating existing damage and swiftly brightening. Proteomic restoration protein mimics the hair’s natural structure to target damage and repair split ends for healthier-looking hair, while a blend of artichoke and rosemary leaf extracts strengthen hair to prevent future damage. A luxurious blend of moringa, olive and sunflower oils deeply hydrate to further repair without weighing strands down. To banish brassiness, pure violet pigments neutralise yellow-orange tones and a brightening complex of lemon, ginger root and chamomile boost brightness for a brilliantly blonde result. A deep treatment that brightens whilst still nourishing your hair is a blondes dream. I use this once a week in place of my usual conditioner and it leaves my hair with that fresh-out-of-the-salon feeling every time. The packaging is beautiful it's worth mentioning that this comes in the form of a mist (which feels pretty odd to use in the shower at first) but trust me it is worth it as the product is distributed evenly and does not weigh my hair down as some creamier treatments do.